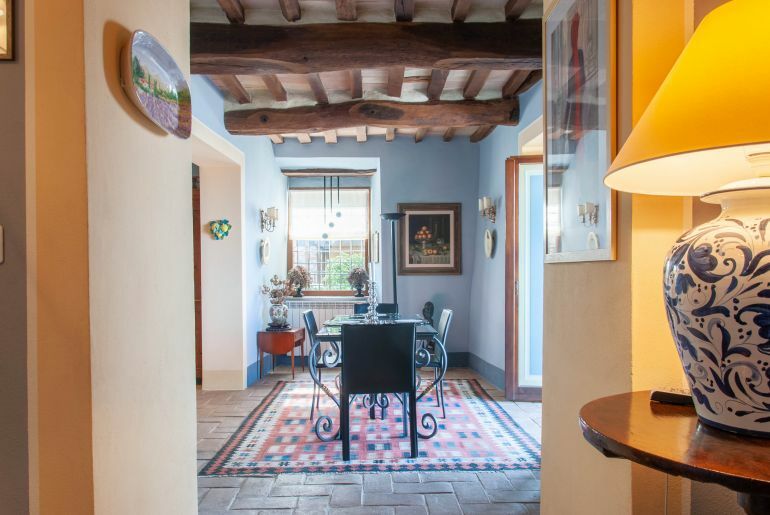 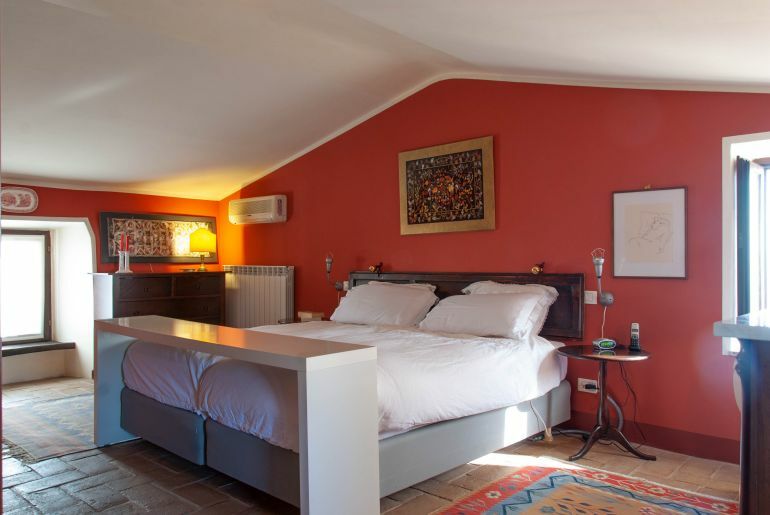 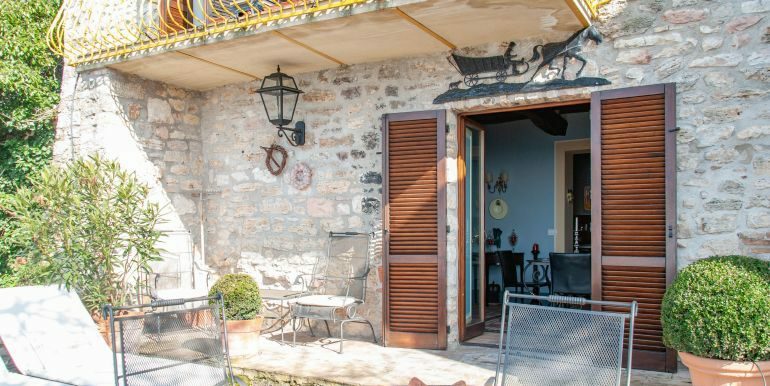 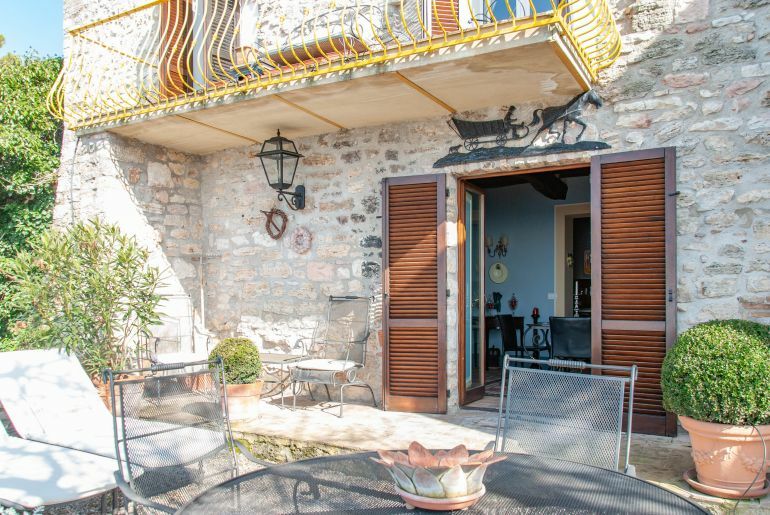 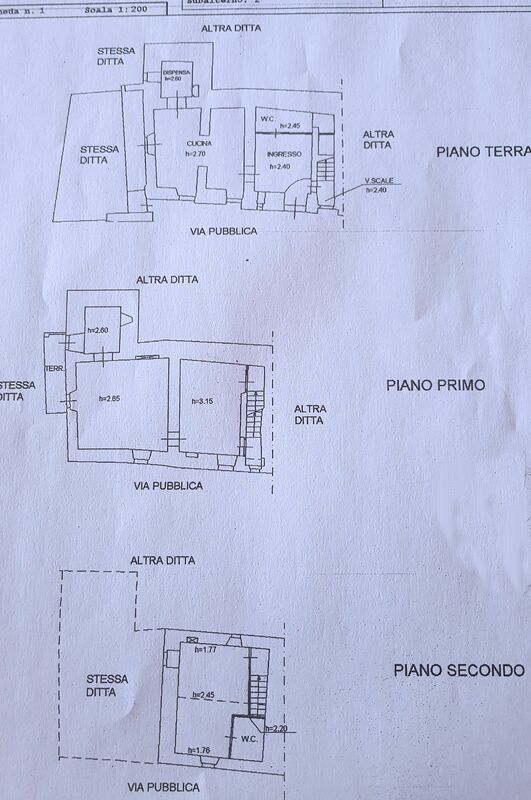 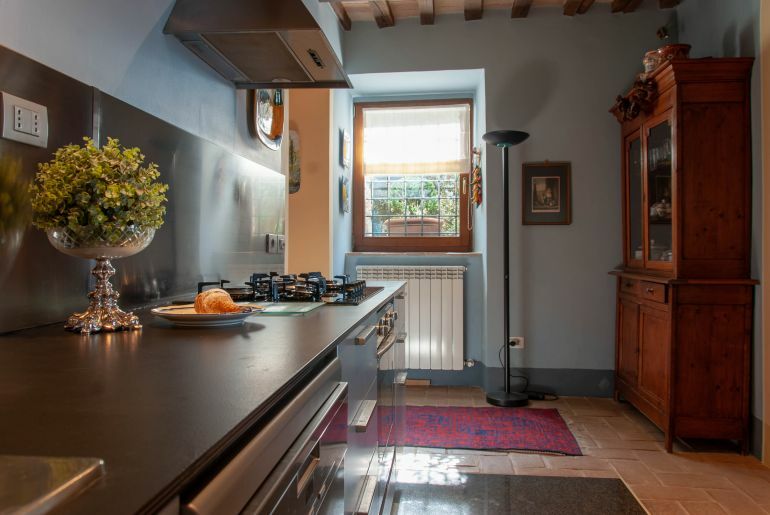 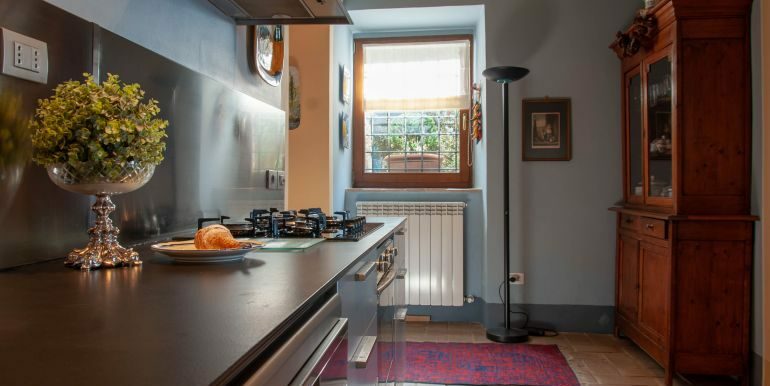 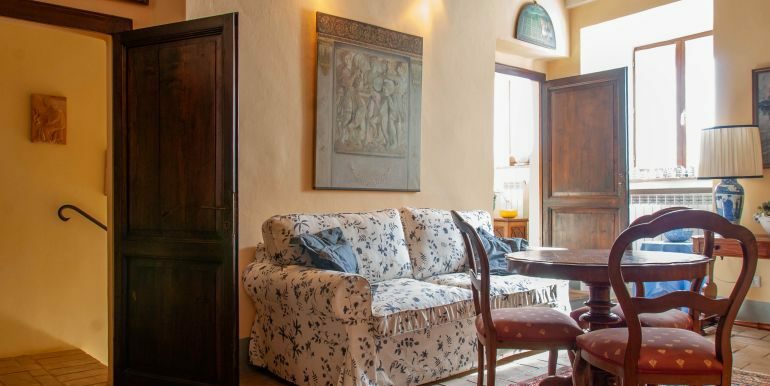 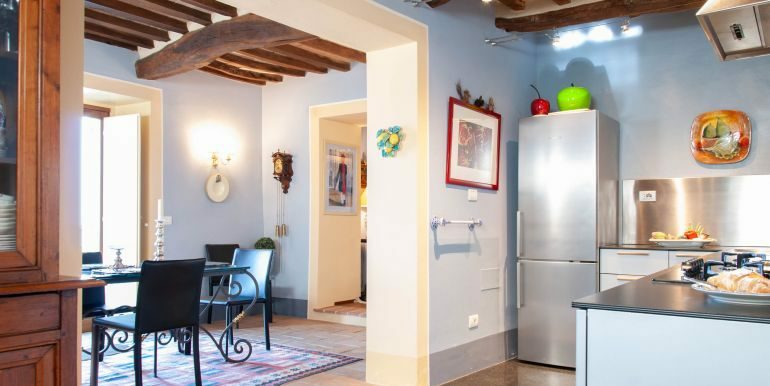 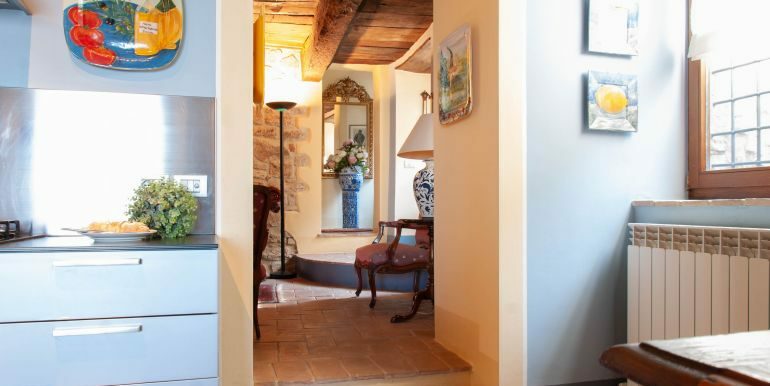 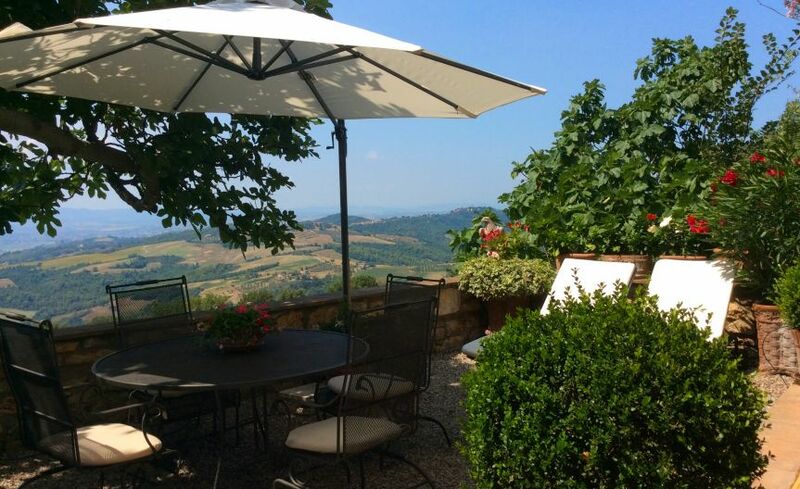 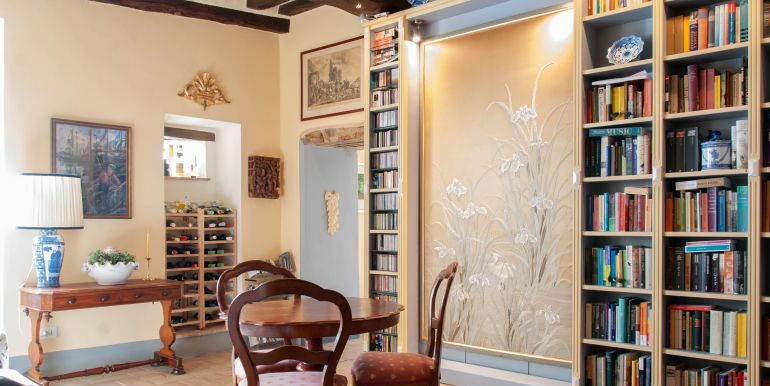 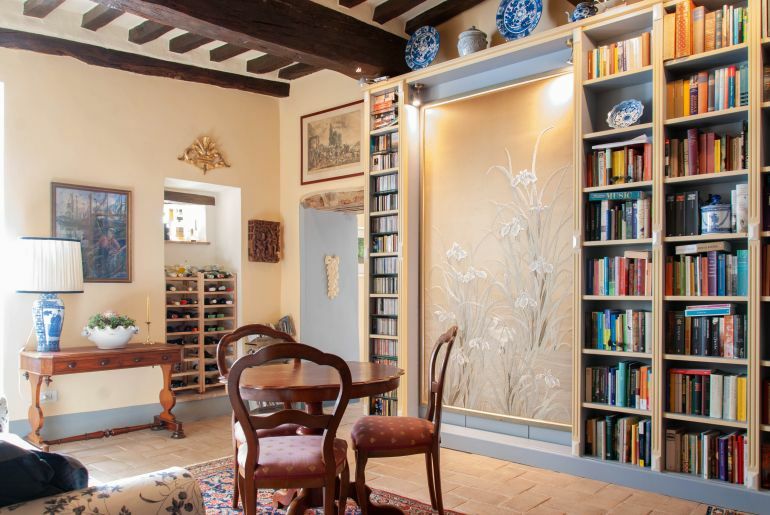 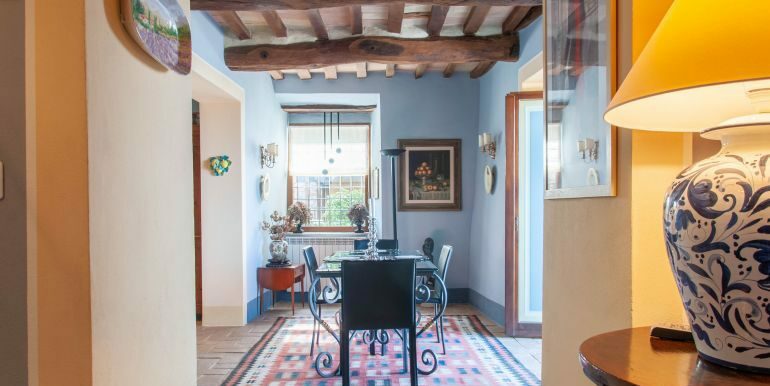 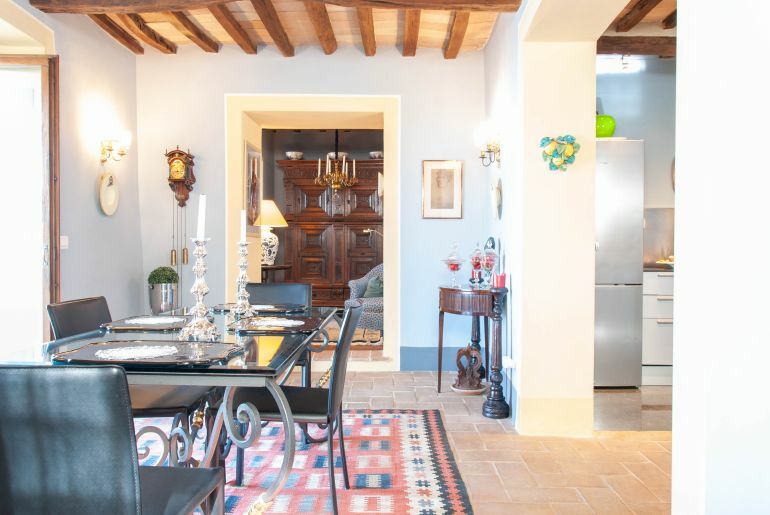 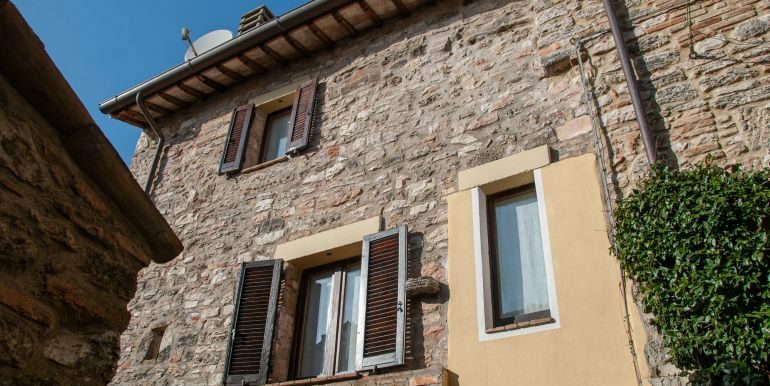 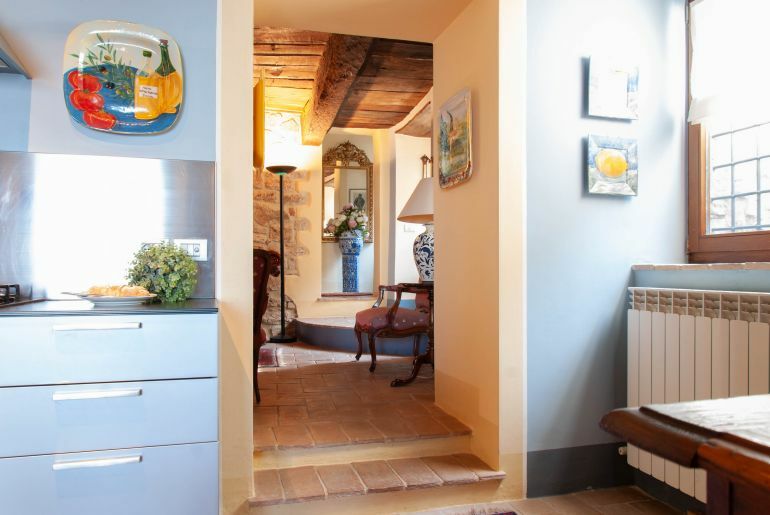 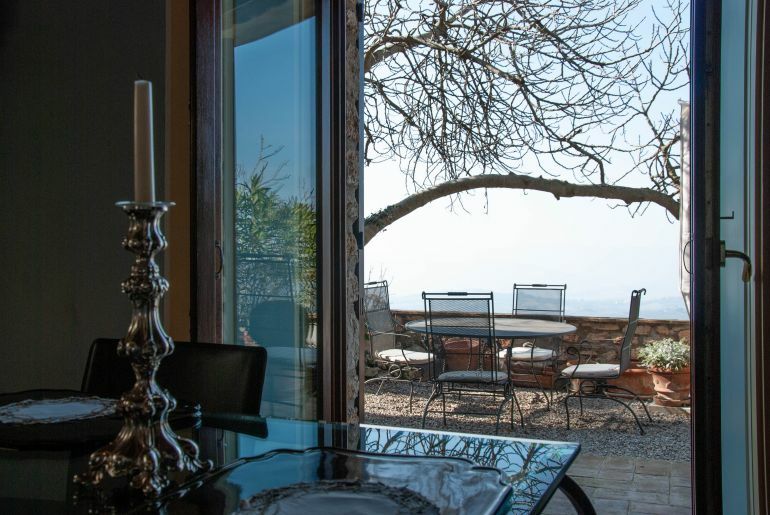 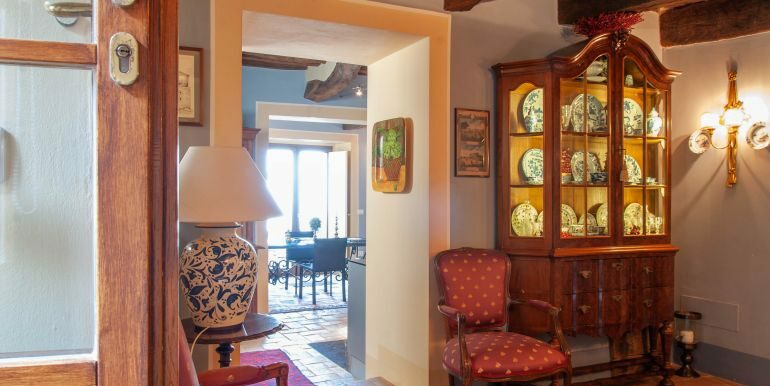 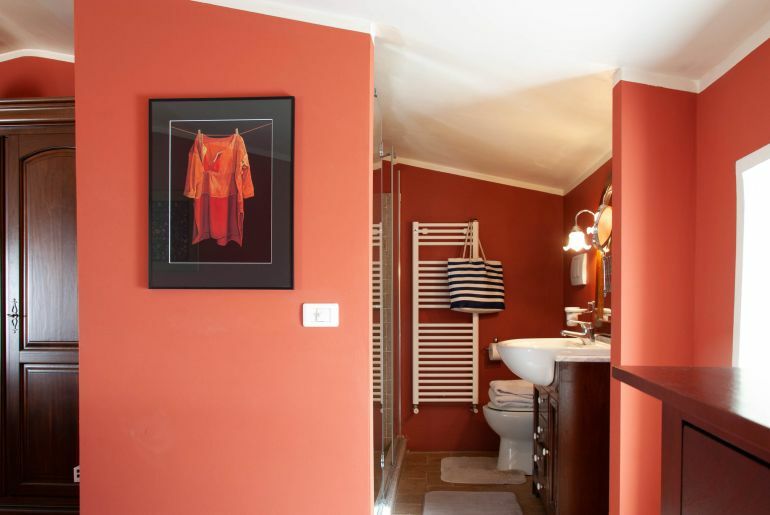 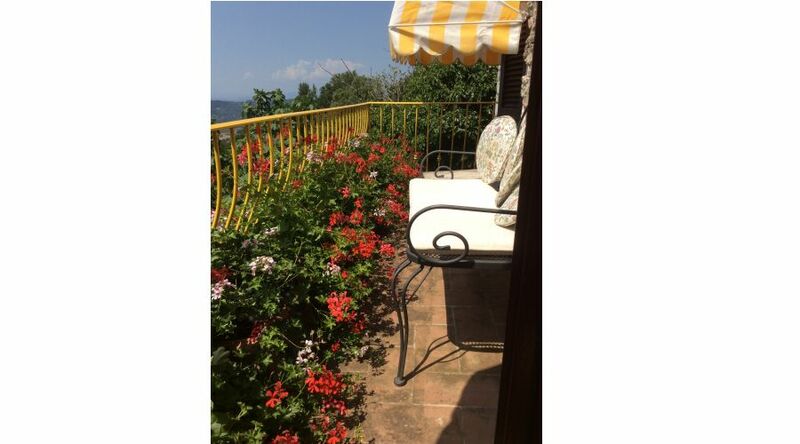 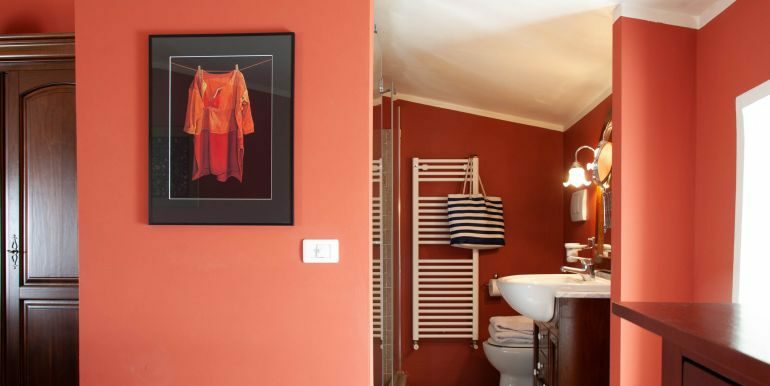 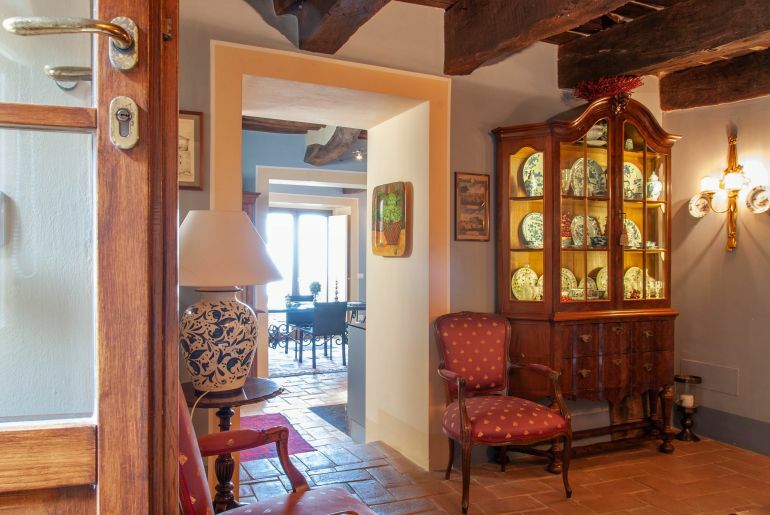 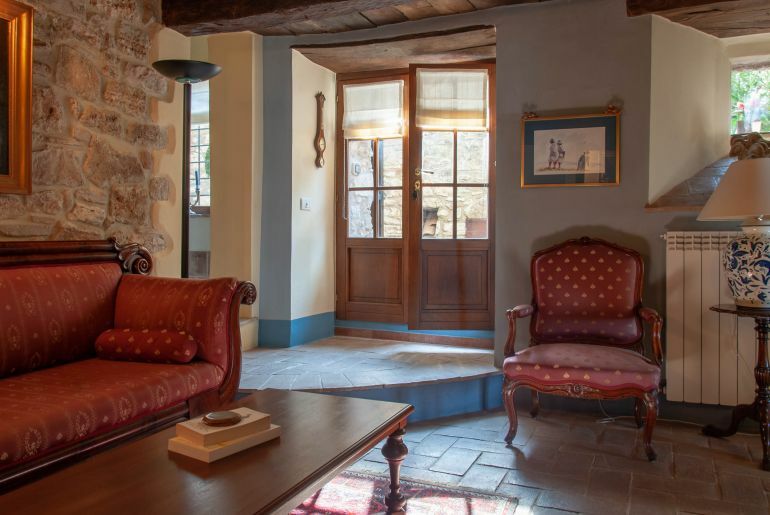 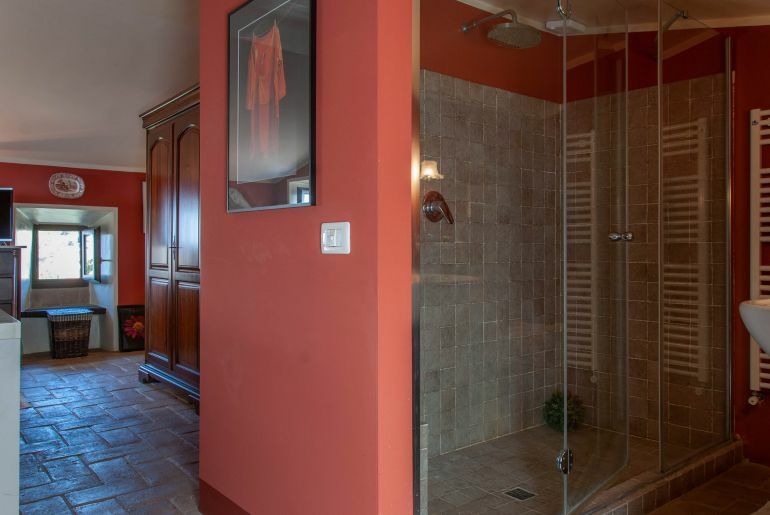 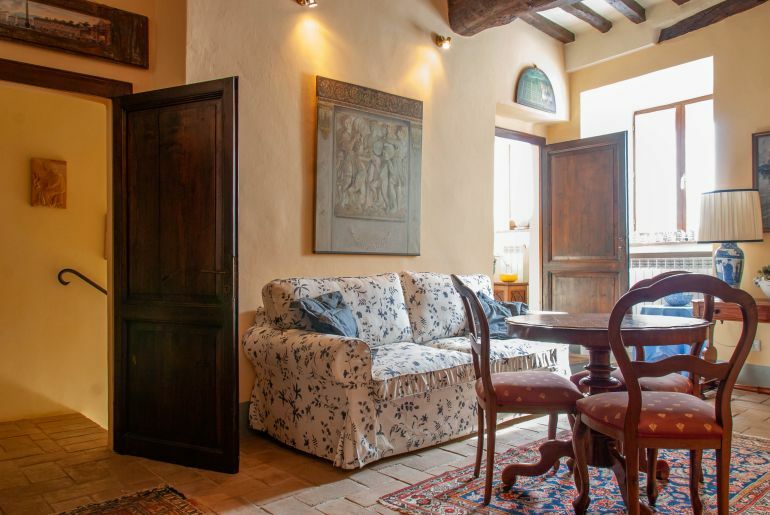 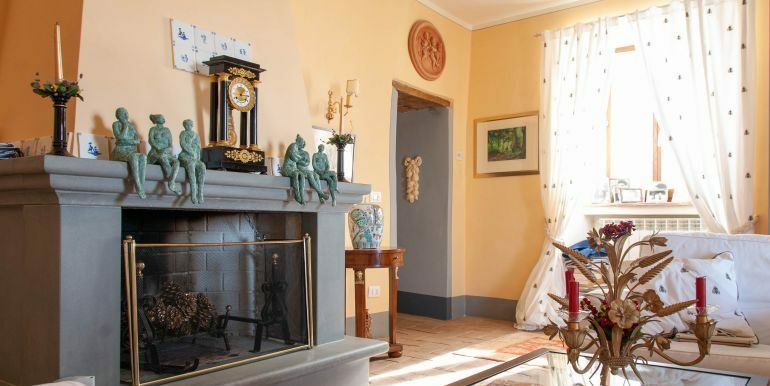 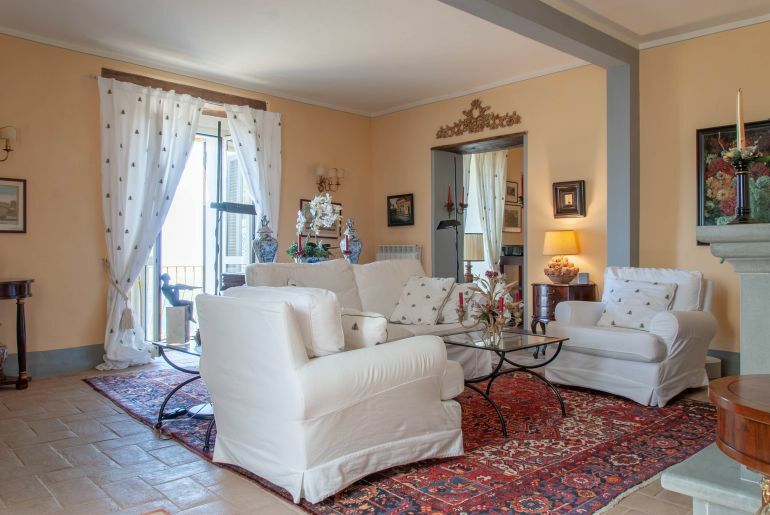 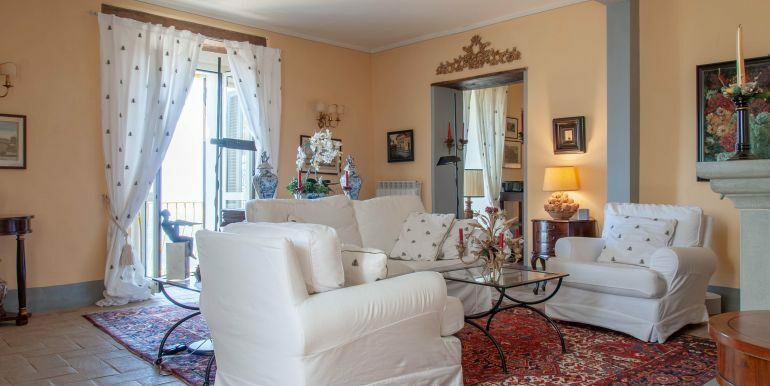 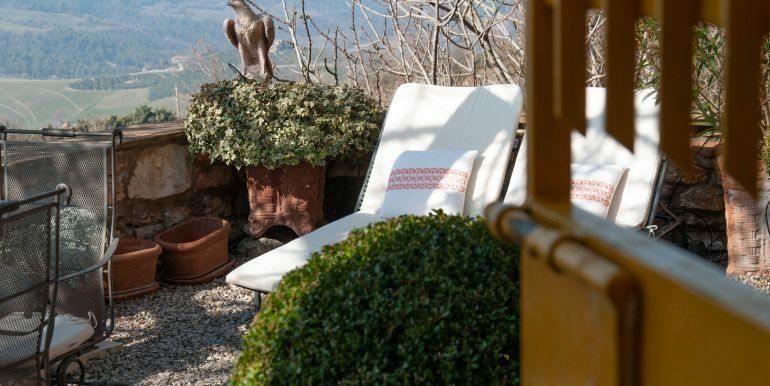 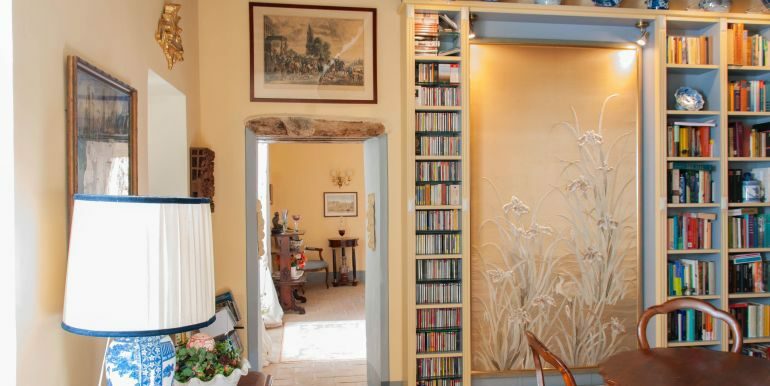 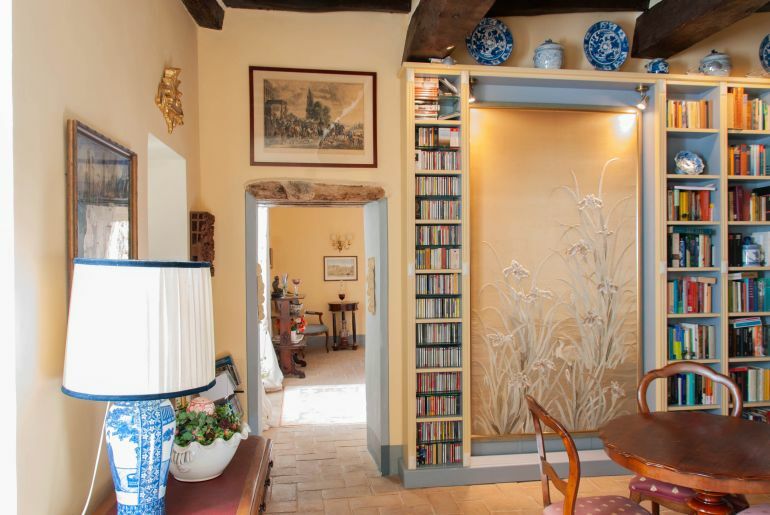 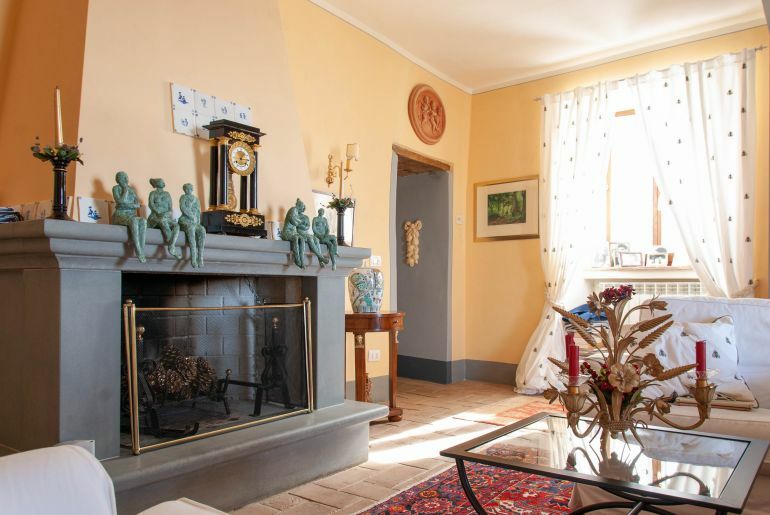 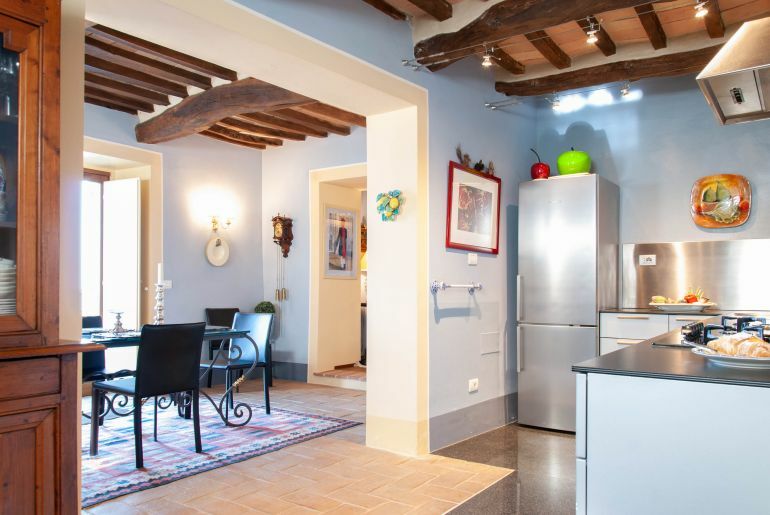 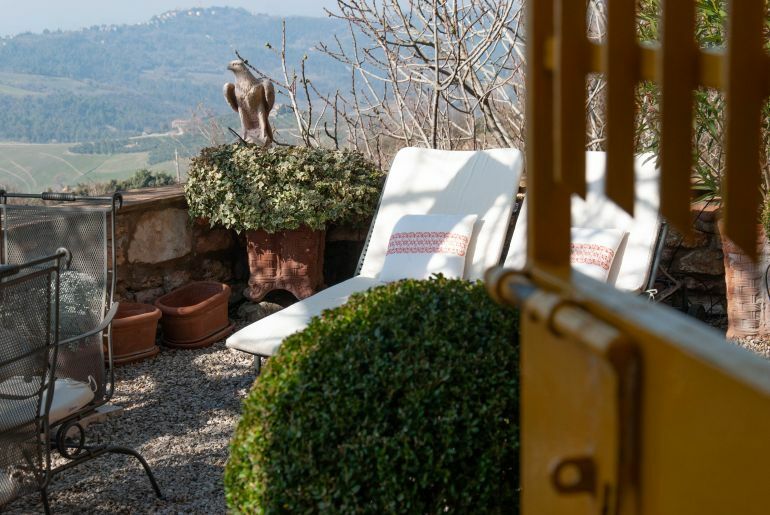 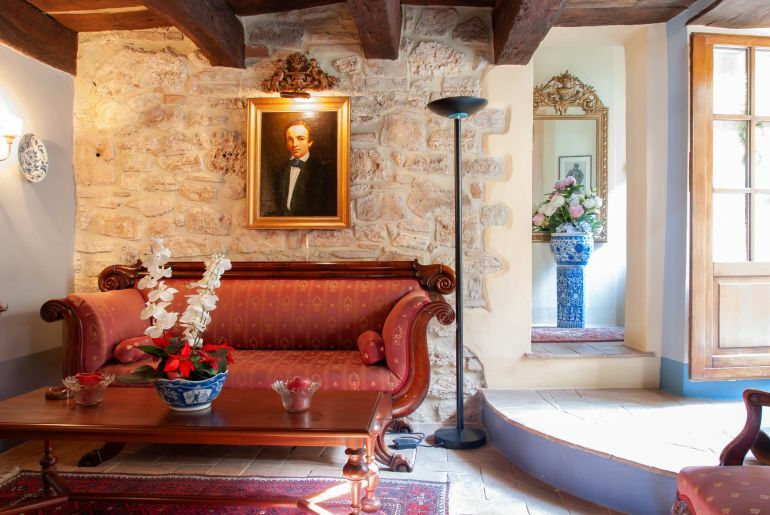 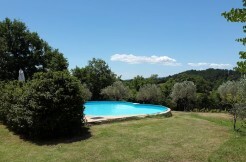 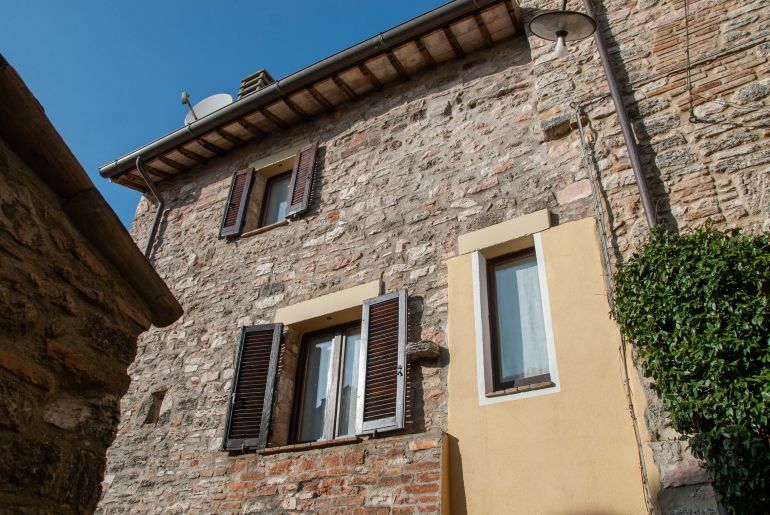 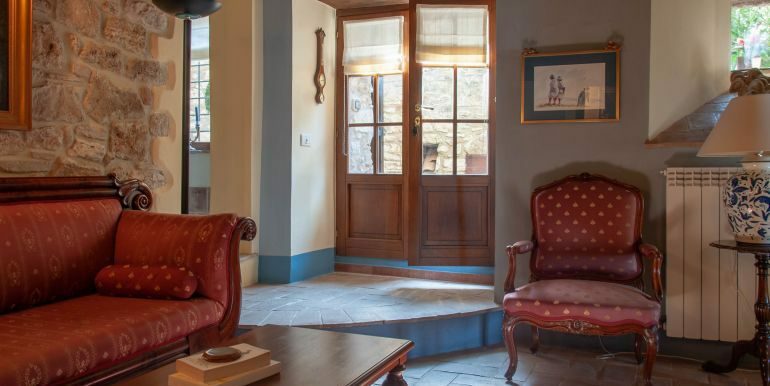 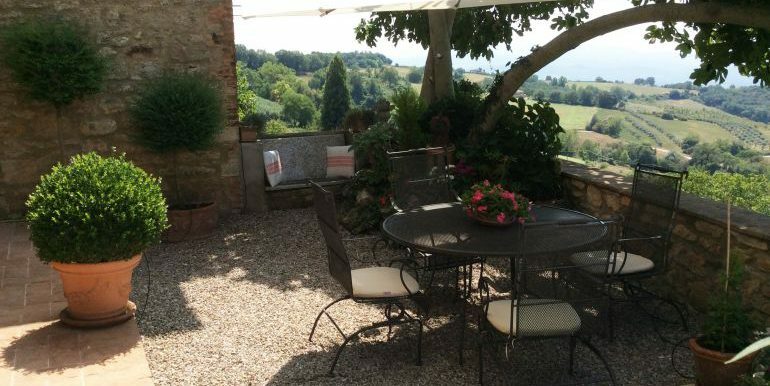 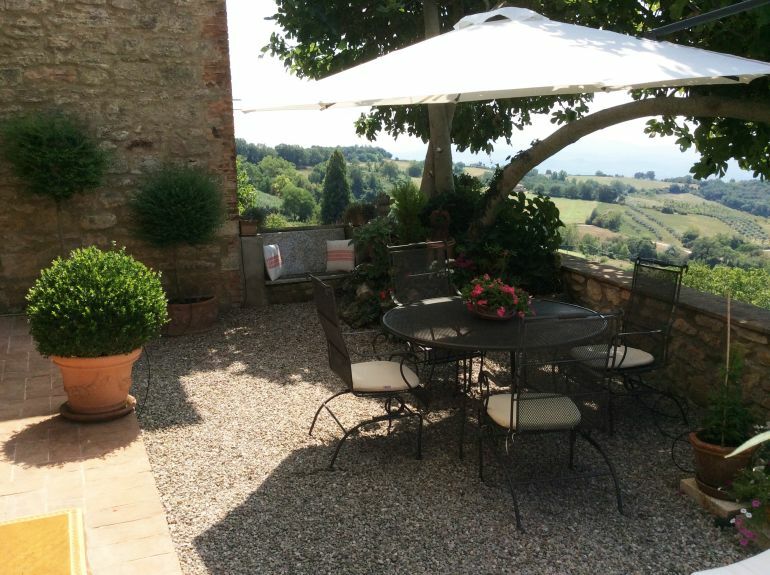 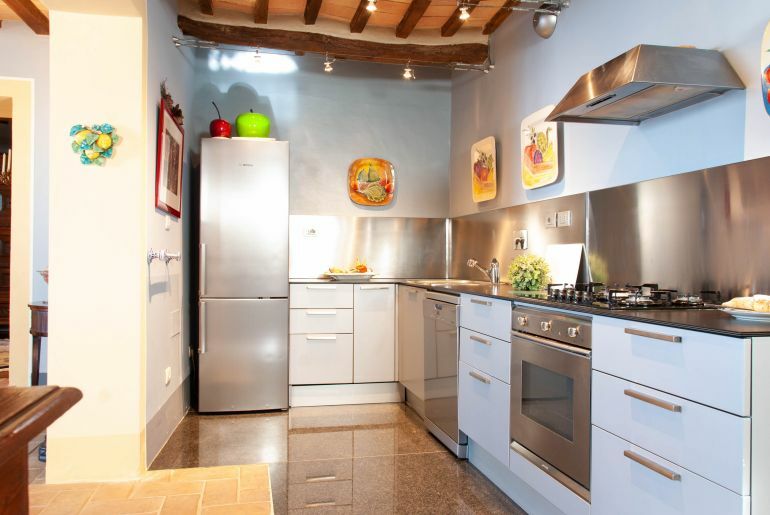 This beautiful completely renovated house is located in a hamlet rich in history near Todi. 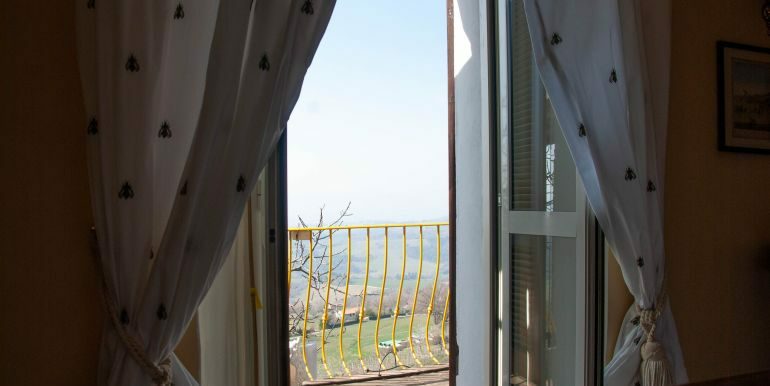 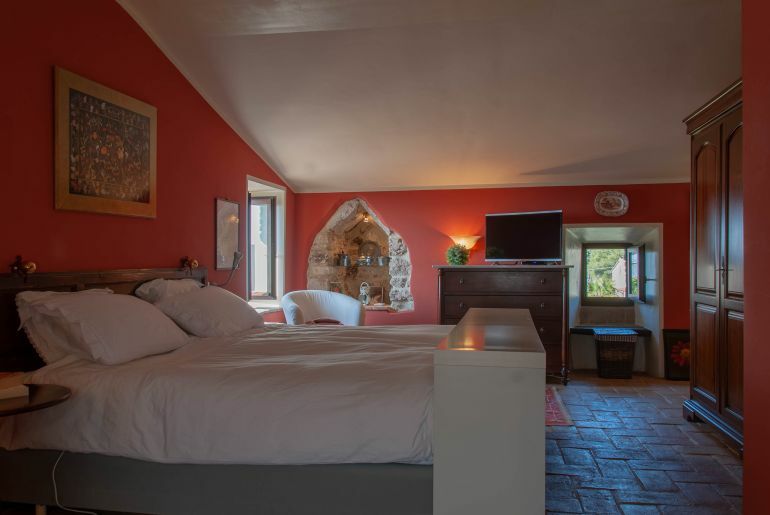 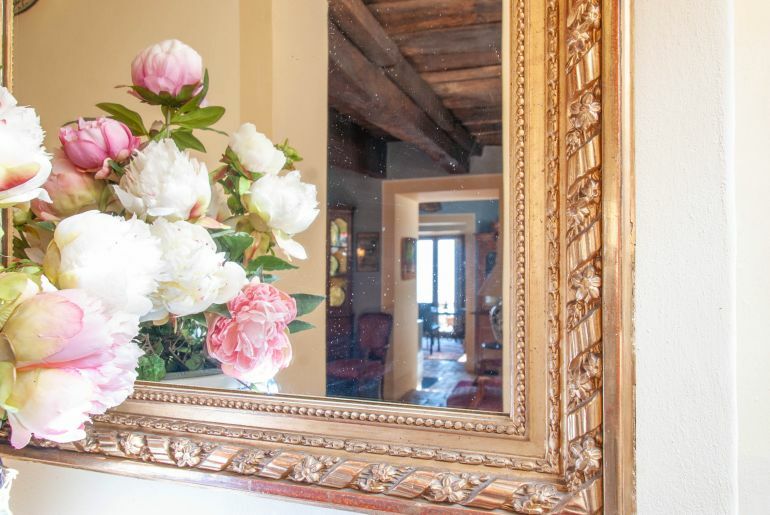 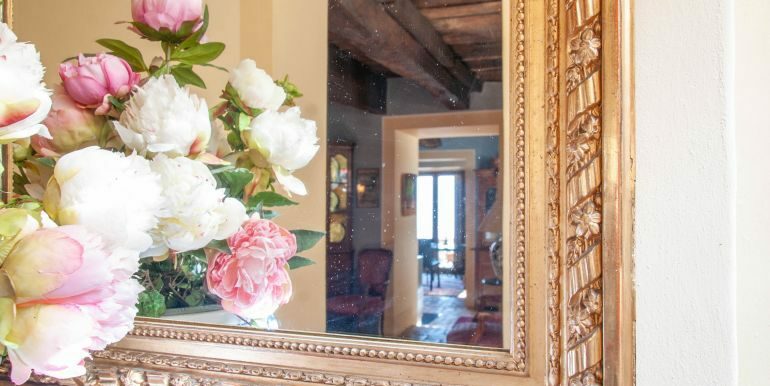 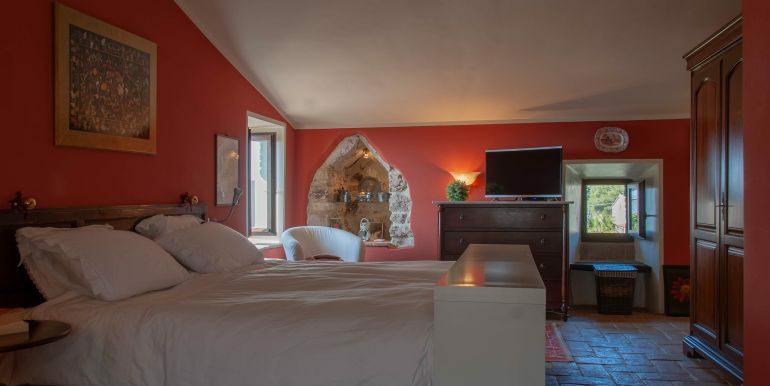 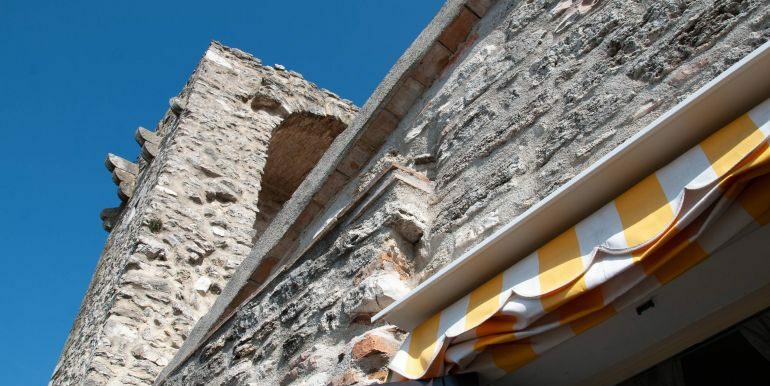 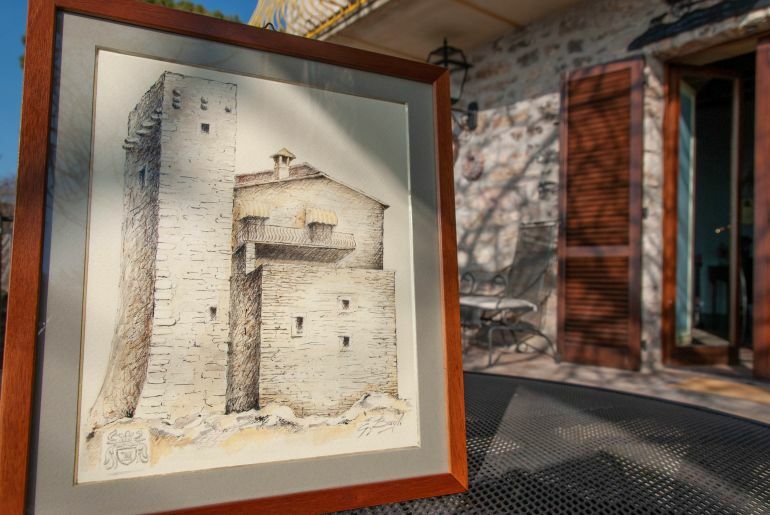 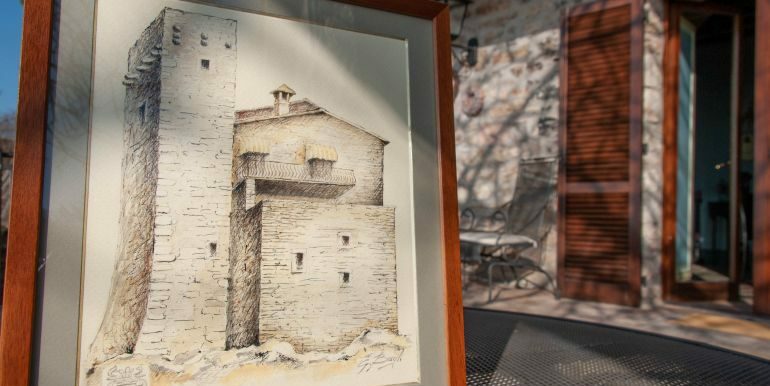 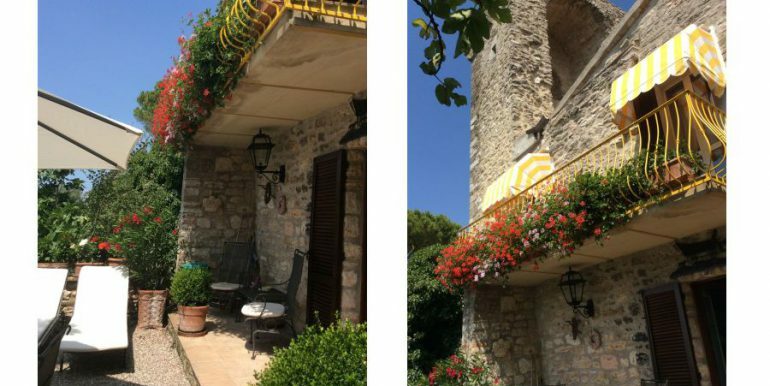 Located on the outside walls of medieval village boasts over two magnificent towers as also a breathtaking view of the Tiber Valley, Todi, Umbrian western mountains and the mountains of Tuscany. 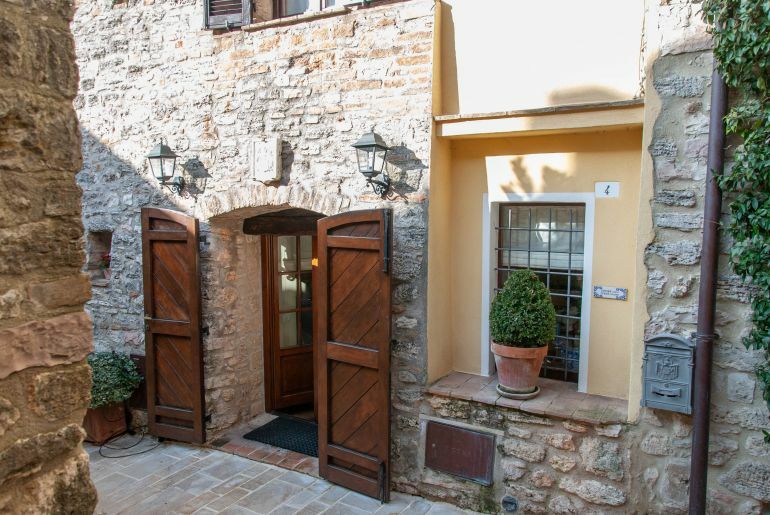 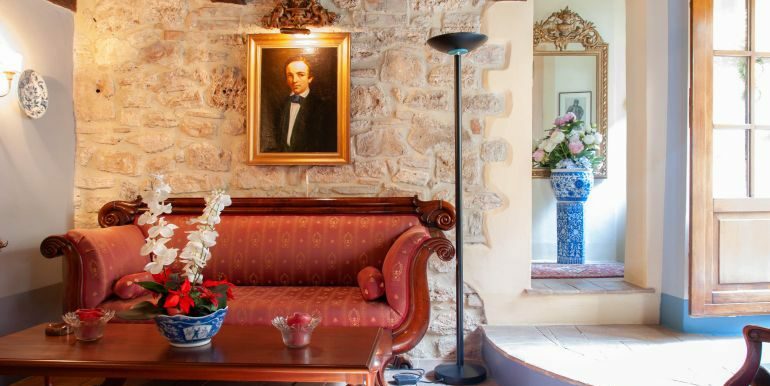 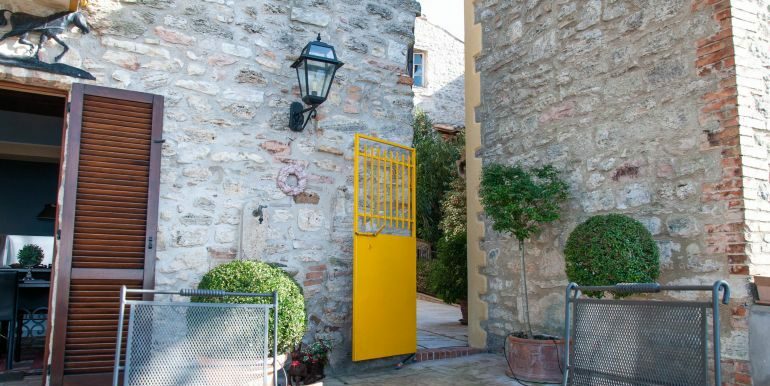 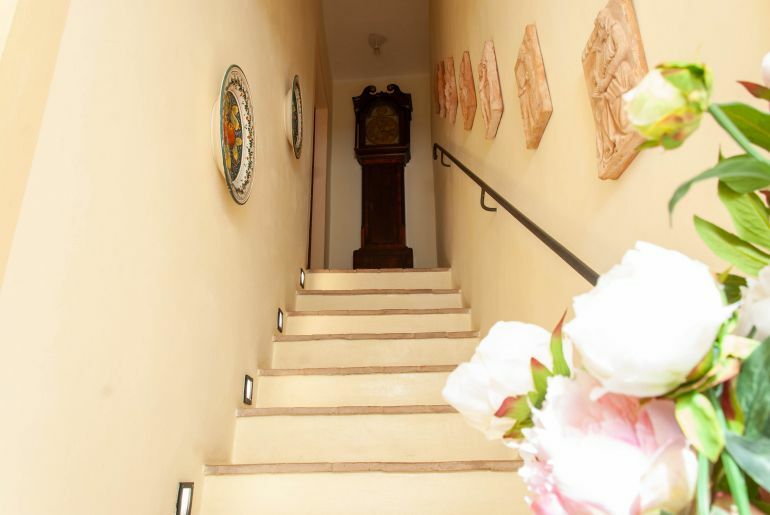 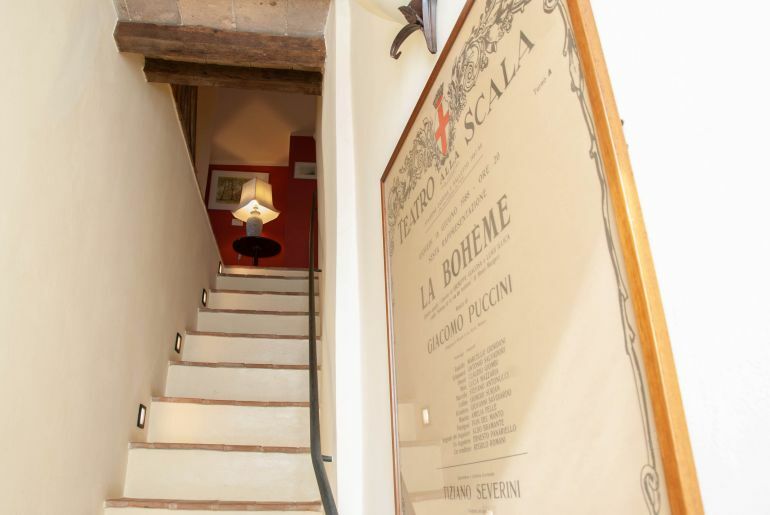 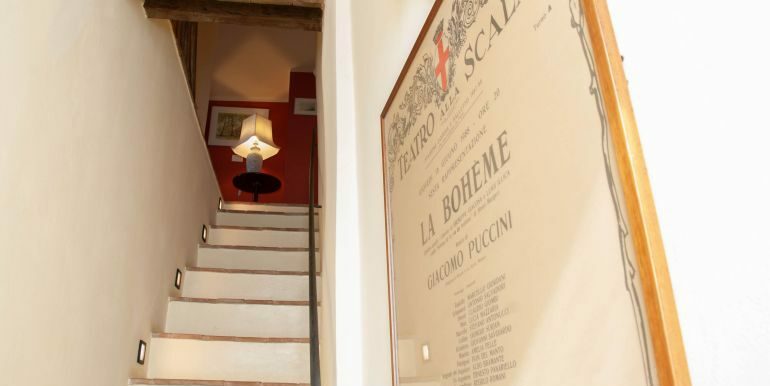 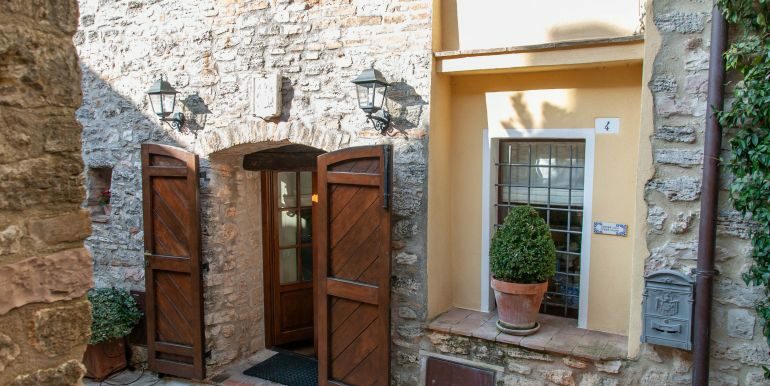 The main entrance of the house is located in a charming alley close to the central square. 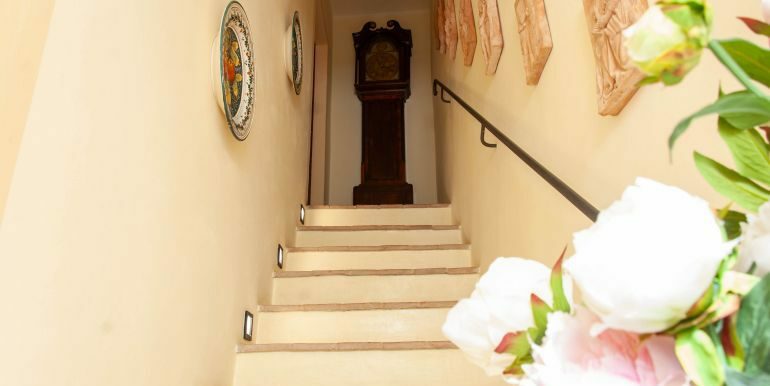 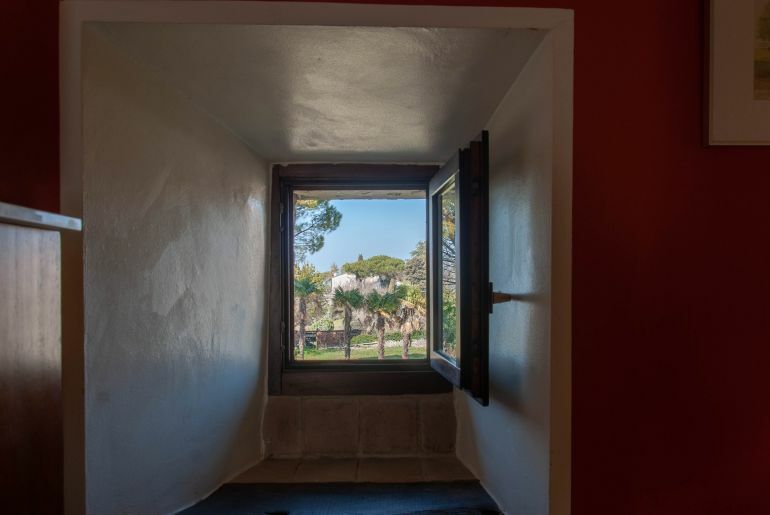 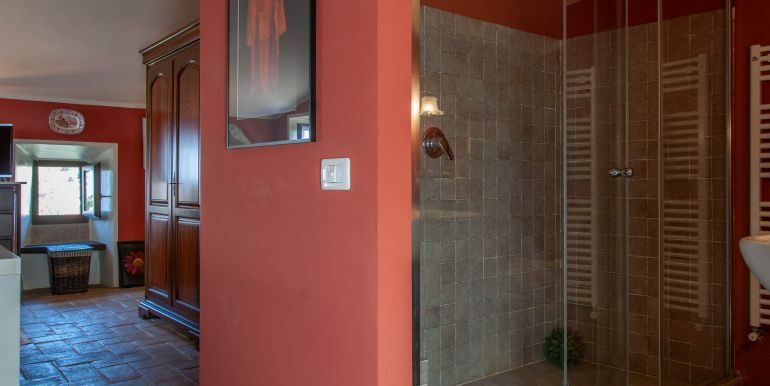 The house boasts seven spacious and bright rooms on three levels and linked by a staircase. 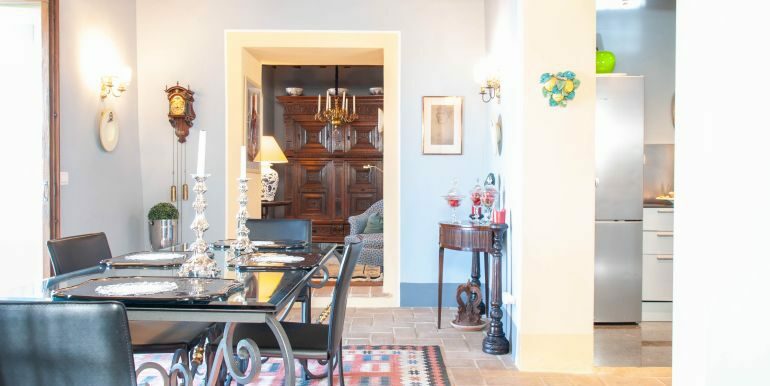 On the ground floor the entrance leads to the living area where there is a lunch room with large windows that open onto the terrace located on the lower tower with stunning views, adjoining the living room there is a very pittoresque room located on the inside of the tallest tower, kitchen and a bathroom with large shower. 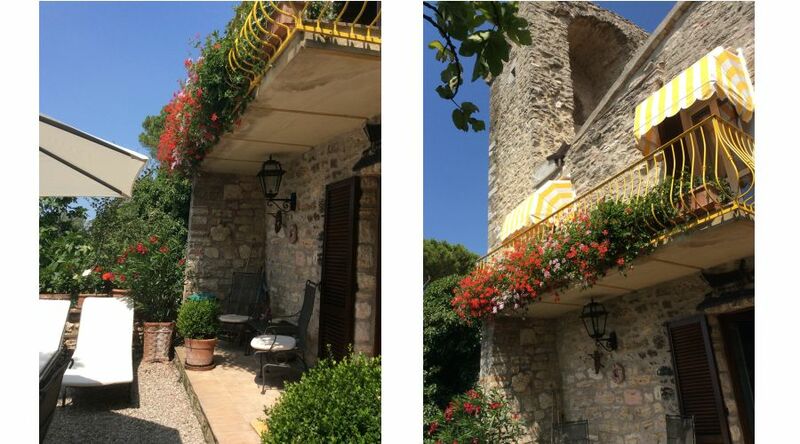 On the second floor there are the guest room, living room with fireplace and balcony and another room in the tower. 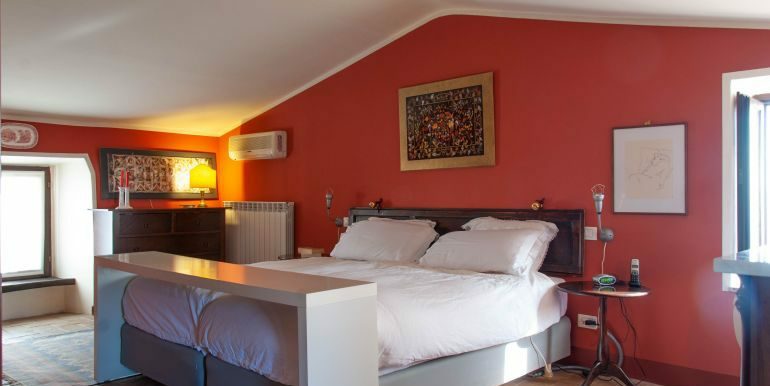 The third floor is entirely used as a sleeping area where we find the master bedroom and a bathroom with large shower. 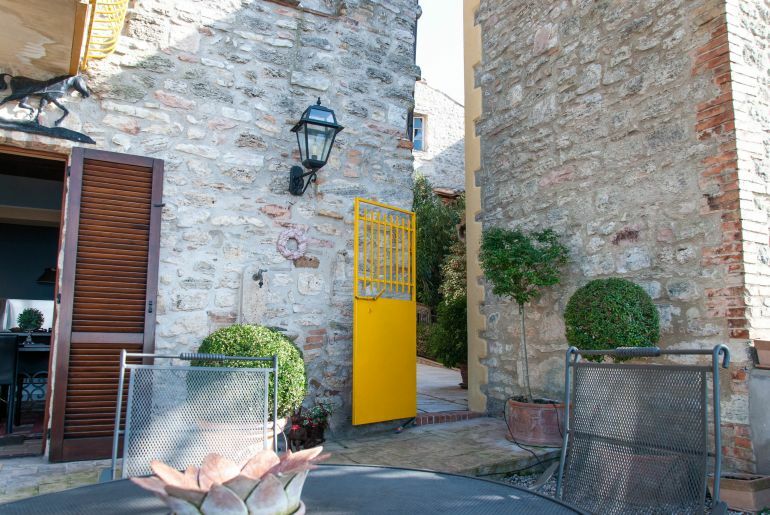 The terrace 65 sq m offers space to live in the open air and is accessible both internally through the dining room and externally via directly from the alley. 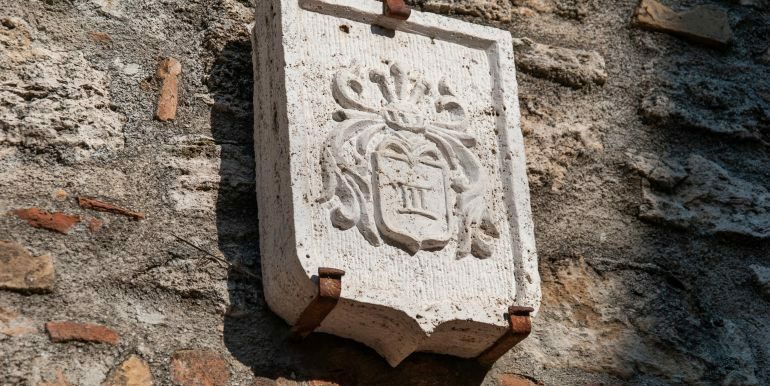 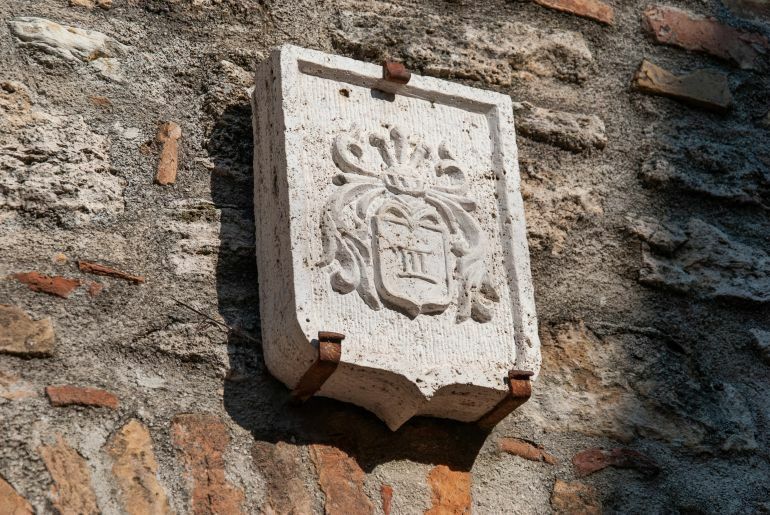 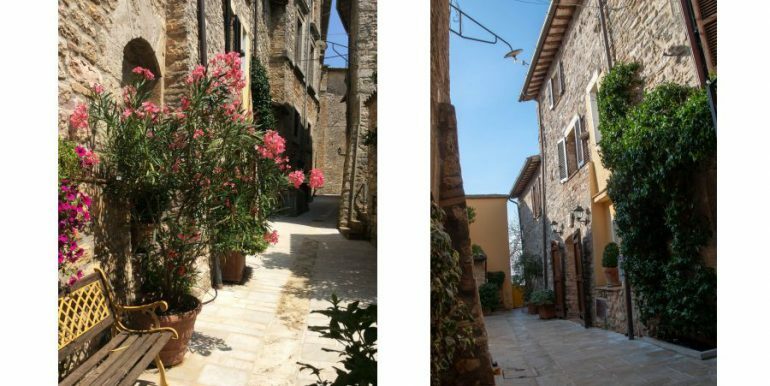 The origins of the village date back to the first century AD and is built completely with local stone such as limestone and travertine. 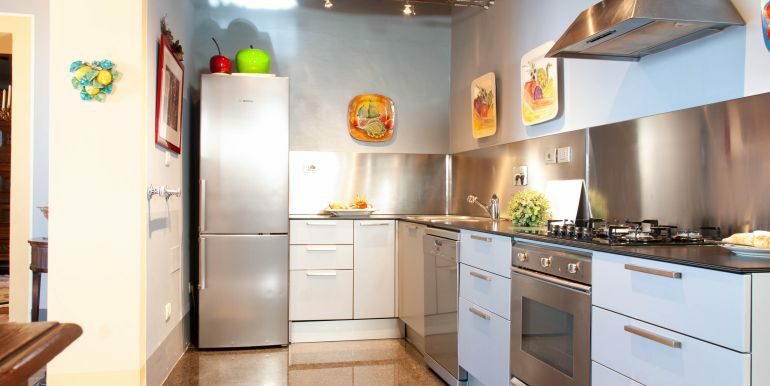 The village offers all main facilities you need such as grocery stores, pharmacies, bars and restaurants. 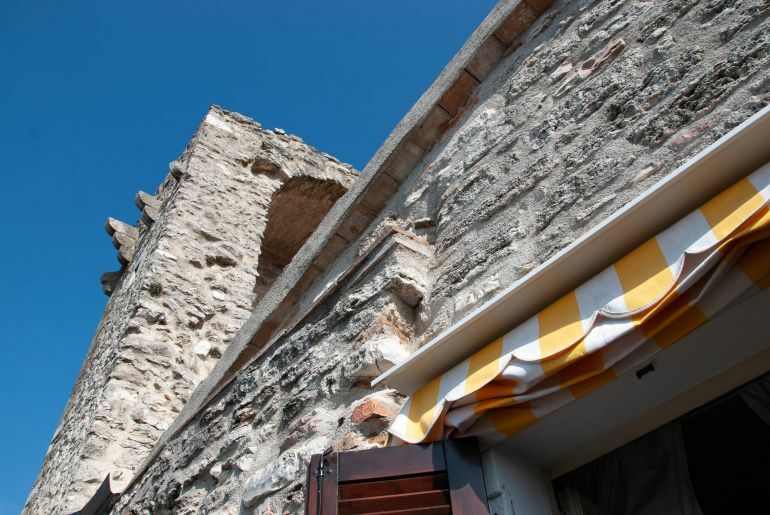 There are many places of historical and cultural interested nearby. 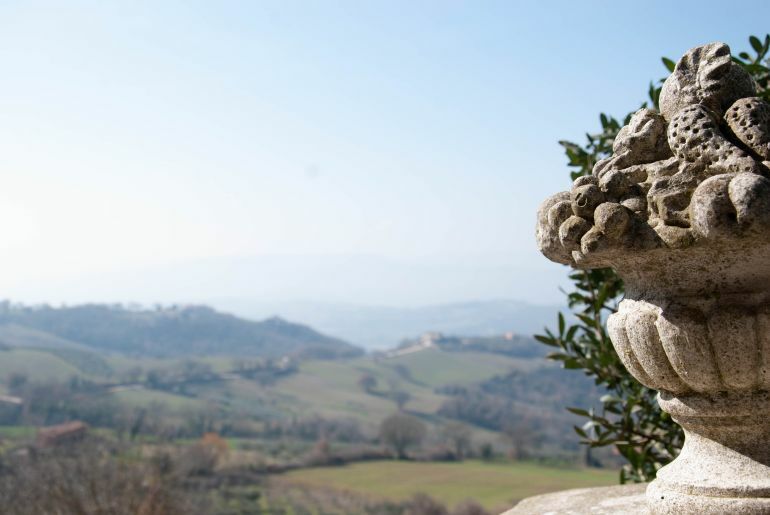 We are in the Sagrantino area and hills with vineyards and olive groves follow one another gently, changing color according to the season. 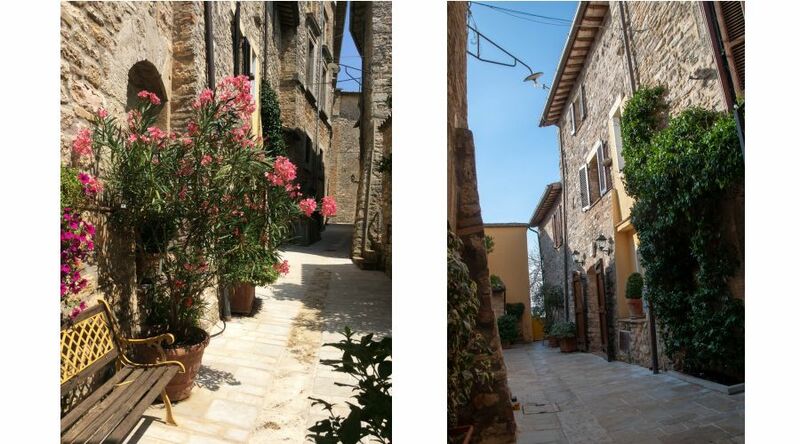 Ancient villages, winding country roads create a beautiful and tranquil scene. 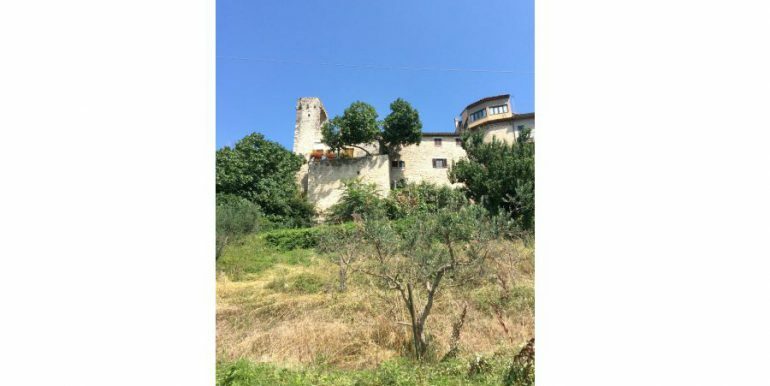 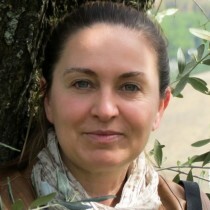 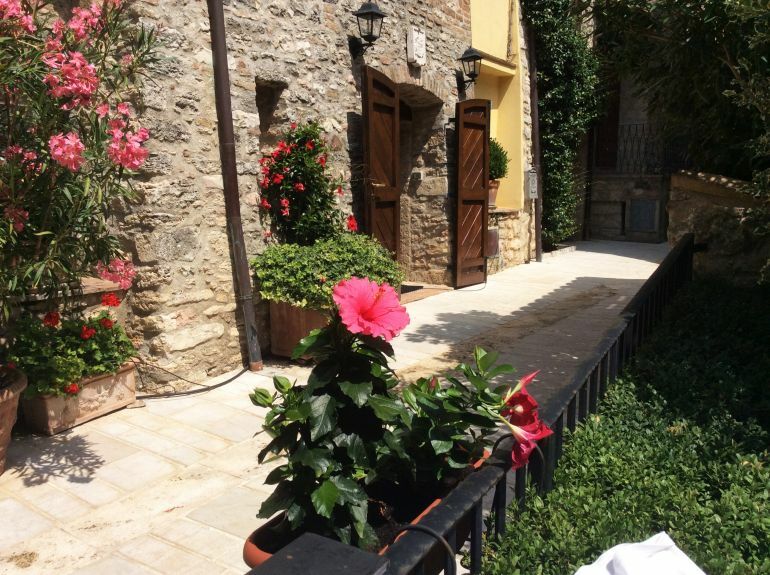 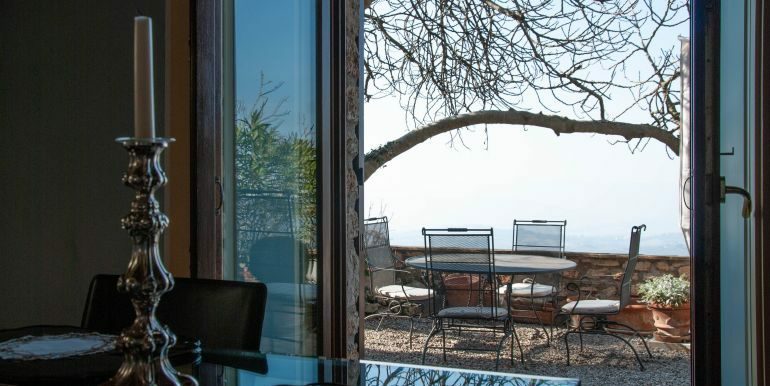 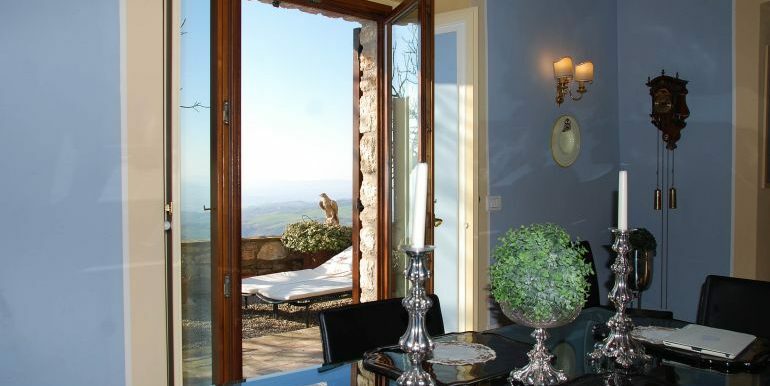 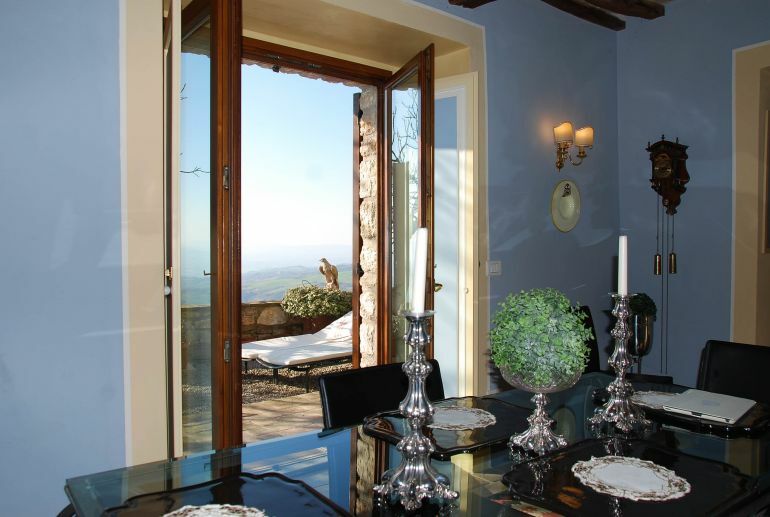 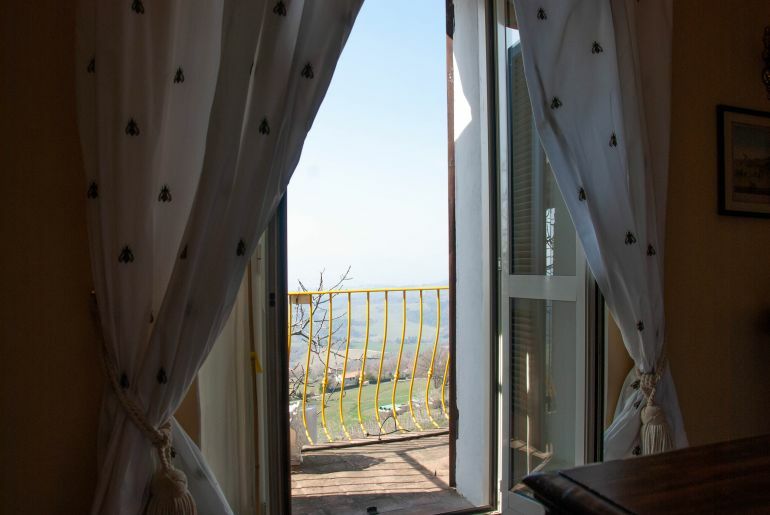 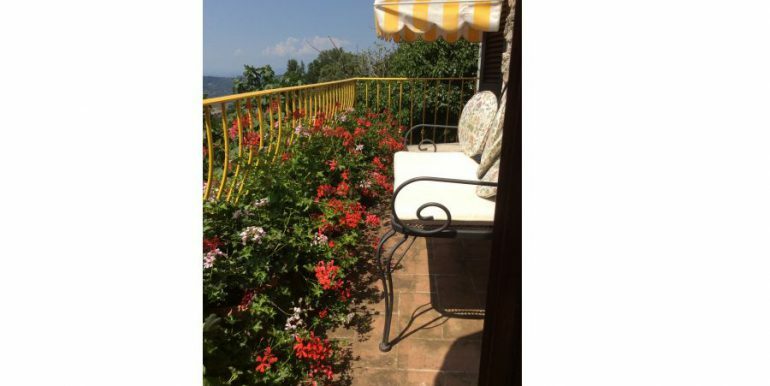 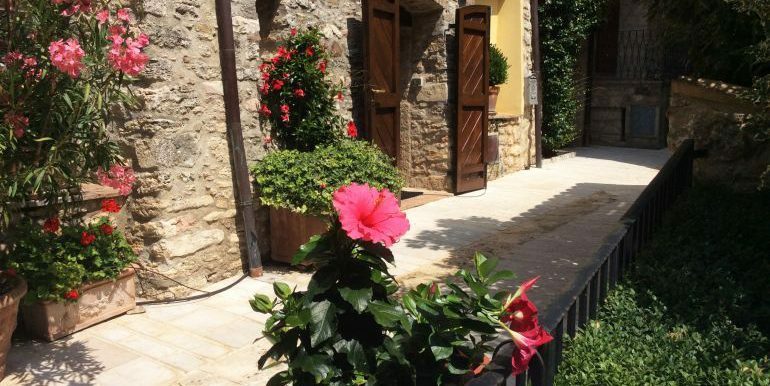 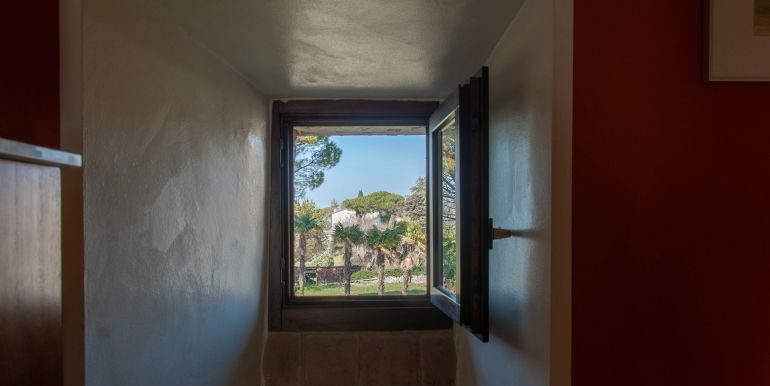 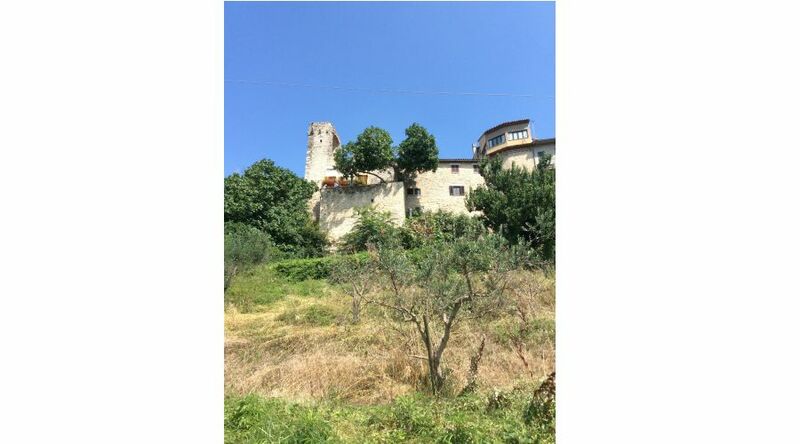 The property is located just 10 km from Todi, Etruscan city and a short drive from art cities such as Assisi, Perugia, Bevagna, Spoleto, Montefalco and Orvieto and they are easily accessible. 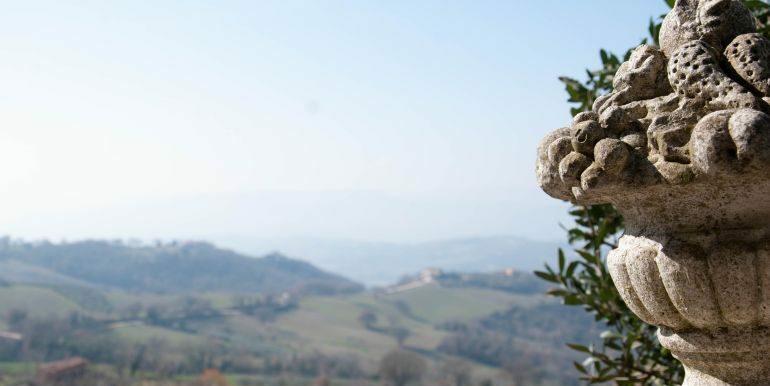 The E45 and the A1 offer a fast connection to Rome and Tuscany. 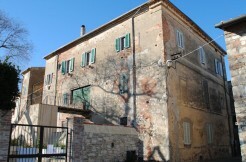 Energy label: C, Ipe 98,3 mq/year.